I got a Cliff Bugger box for my birthday this year, so it's time to fill it up. 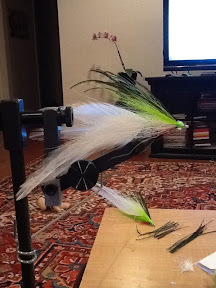 Right now I'm tying up a few deceivers. 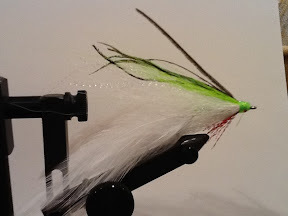 A classic Lefty pattern that I've used with good success in the Chesapeake Bay. 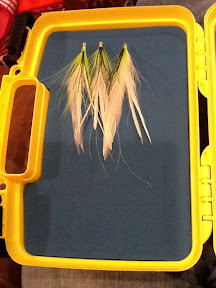 I tied these on 1/0 and 2/0 hooks. The 1/0 is a Mustad 3407. These things are dull out the package so I would not recommend buying these hooks. I'll sharpen them and they'll be ok. The 2/0 is a 34007 and it seems to be a bit better. Lots of room left so time to get busy.